Could it be possible to set up health care co-ops in a third world country, maybe starting with a foundation of small, local dairy co-ops? HealthPartners decided to explore that possibility. A team from HealthPartners went to Uganda to meet with the co-op leaders. Two doctors and two administrators made that first trip. We met with dozens of rural Ugandan co-op leaders in half a dozen locations, and we concluded that it was worth a try. This book describes what the staff from HealthPartners has learned and accomplished since that time. There are now working health care co-ops in Uganda. They are serving thousands of people in a dozen villages and rural communities. People are getting care that they wouldn't have gotten without the co-ops. George C. Halvorson was named chairman and chief executive officer of Kaiser Foundation Health Plan, Inc. and Kaiser Foundation Hospitals, headquartered in Oakland, California, in March 2002. Kaiser Permanente is the nation’s largest integrated health plan, serving more than 8.4 million members in nine states and the District of Columbia. Halvorson has more than 30 years of health care management experience. He was formerly president and CEO of HealthPartners, headquartered in Minneapolis. Prior to joining HealthPartners, he held several senior management positions with Blue Cross and Blue Shield of Minnesota. He was also president of Senior Health Plan, as well as president of Health Accord International, an international HMO management company. Halvorson serves on a number of boards, including those of America’s Health Insurance Plans and the Alliance of Community Health Plans. He is the current president of the board of directors of the International Federation of Health Plans, and a member of the Harvard Kennedy School Healthcare Delivery Policy Program, the Commonwealth Fund Commission on a High Performance Health System, and the new Institute of Medicine Task Force on Evidence-Based Medicine. He also serves on the Executive Council of La Clínica, and on the Ambassadors Council of Freedom From Hunger, an international development organization working in 17 countries. He is a former board member and trustee of the National Cooperative Business Association. Halvorson is the author of books on health care, including Epidemic of Care, published in April 2003, and Strong Medicine. He is currently writing two new books, one about racial prejudice around the world, the other about how to systematically reform health care in America. He has written numerous articles on subjects ranging from health information technology to the changing marketplace. Halvorson has interacted in a number of settings with academics, policy makers, and health industry leaders, including the HR Policy Association, the World Bank, the European Health Care Congress, the National Business Group on Health, the Microsoft Annual Health Plan Executive Forum, the National Governors Association, the World Health Care Congress, and a number of universities and colleges. He has served as an advisor to the governments in Great Britain, Jamaica, Uganda, and Russia on issues of health policy and financing. Portland, Oregon, 97232 USA; phone 503-813-4387, fax 503-813-2348. "The developing world carries 90 percent of the global burden of illness but spends less than 10 percent of total worldwide health resources. Even in poor countries, the major causes of illness are both well known and within their financial reach. Yet lack of public funding and ineffective health services often prevent poor and other vulnerable households from having access to basic care. In this book George Halvorson — the CEO of Kaiser Foundation Health Plans and one of the leading thinkers on managed care — applies his knowledge to the special challenges faced by Uganda, a small country in the center of Africa. The book provides a fascinating chronicle of community-based action at its best — small rural cooperatives that have joined people together at the local level to support each other’s health needs. Mr. Halvorson brings to this debate his outspoken and widely lauded views on affordable and quality health care — services that can be both consumer-oriented and sensitive to cultural needs. The book provides a fascinating voyage through the health challenges faced by the developing world and a ray of hope for millions of people." "Stories like this are stories of how the world grows — better and healthier —how people helping people, people working together, can bring what looks like on its surface that which is impossible, possible and ultimately actual. 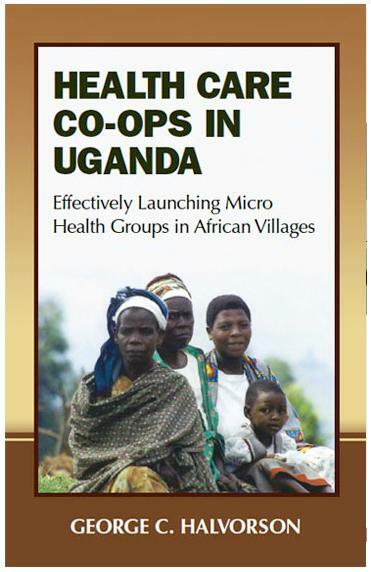 Three cheers for George Halvorson and his band of sensible, committed, smart and technically well-grounded Minnesotan health care co-op missionaries, who together with the co-op folks of Uganda, have created a model of self-help development that we can all learn from. We’re looking at simplicity at its elegant best, efficiency at its ultimate, how to get the most from the least, in an area of human need — health care — that is fundamental to human development and well-being and yet without that most basic of human potential — cooperation — is not always available. Okay ... five cheers!"